Back in 2013, I actually wrote something vaguely nice about HBO’s Bill Maher. Or at least I expressed approval for a point he made about the limits of class-warfare taxation. It’s now time to compensate for that action. Check out this interview. It’s about Obama’s new tax-and-spend budget, but pay particular attention at the 5:15 mark of the video and you’ll hear Maher asserting that “socialism” deserves the credit for the development of a thriving middle class in America. Wow. Maher’s comments are astonishingly illiterate. As I remarked in the interview, the United States (like other western nations) had a tiny public sector during the period when it transitioned from agricultural poverty to middle-class prosperity. Federal spending averaged only about 3 percent of economic output, and overall government spending (including state and local governments) was only about 10 percent of GDP. If that was socialism, then sign me up! This isn’t to say we have laissez-faire paradise in the 1800s and early 1900s. Some of the so-called Robber Barons were cronyists who used government favoritism to line their pockets. 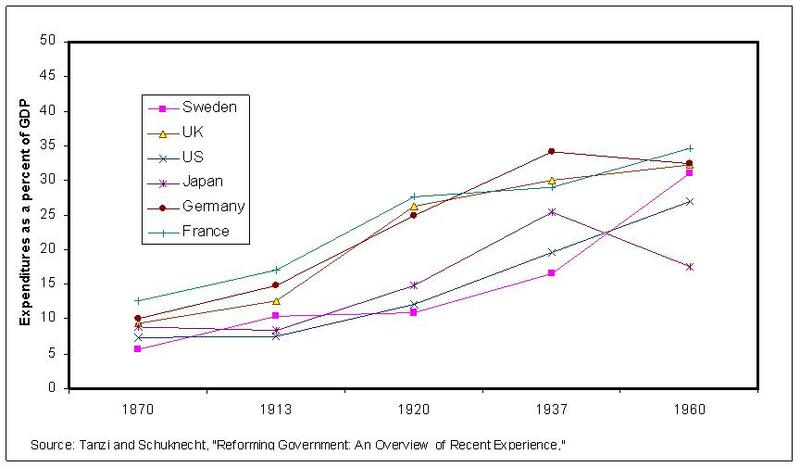 Monetary policy oftentimes was a mess because of government regulation and control of banks. Tariffs were very onerous. And Jim Crow laws were an odious example of government power being used to oppress an entire class of citizens and hamper their ability to participate in the market economy. But the one thing we didn’t have back then was socialism, whether you use the right definition (government ownership of the means of production) or the sloppy definition (a redistributive welfare state). Enough on that topic. The bulk of the interview, of course, focused on Obama’s budget. I got in my main point, which is that we need to focus on restraining the growth of government spending. So rather than recycle my thoughts, let’s cite comments by two wise observers. Here’s how Dan Henninger of the Wall Street Journal described the President’s plan. The president’s annual budget reminds the Beltway tribes of what they do—tax the country, distribute revenues to their allies, and euphemize it as a budget. With his 2015 budget, Barack Obama at last makes clear his presidency’s reason for being: to establish an empire of taxation. …In six years, the Obama Democrats have abandoned any belief in the idea that the private sector is the primary cause of American prosperity. Instead, they seem to see the private sector as a kind of tax sump-pump, a dumb machine whose only purpose is tax flow. …That is the empire of taxation. It is an isolated system, based in Washington, which allocates what it exacts from the private sector. And here’s some of what George Will wrote about the poisonous spiral of more government leading to more stagnation leading to more demands for more government. The progressive project of maximizing the number of people dependent on government is also aided by the acid of insecurity that grows rapidly when the economy does not. Anxious and disappointed people are susceptible to progressives’ blandishments about the political allocation of wealth and opportunity — “free” this and that. By making slow growth normal, iatrogenic government serves the progressive program of defining economic failure down. I fully agree. Not only the points about the weakness of the Obama “recovery,” but also the concerns about more and more people being lured into government dependency, which sabotages American exceptionalism. Jerry Holbert has a nice summary of the President’s worldview. Hmmm…I think we’ve seen this bookstore before. 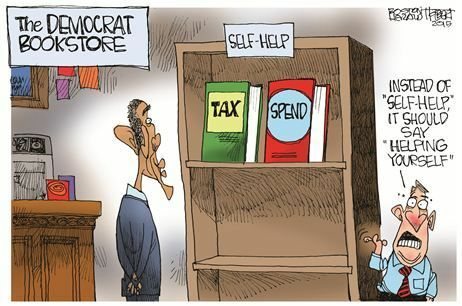 Though I’m surprised Obama is bothering to shop when he can just go to the library for his favorite books. Wonderful website you have here but I was wondering if you knew of any user discussion forums that cover the same topics discussed in this article? I’d really love to be a part of community where I can get feed-back from other knowledgeable people that share the same interest. If you have any recommendations, please let me know. Thank you! Roselands Junior Public School is a government-funded elementary school in proximity to marginalized ethnic communities in Toronto, Ontario, Canada. There’s no other way to say this. The Principal of Roselands Junior Public School, Mrs Jill Norman, with the help of her cronies at the Toronto District School Board, are trying to censor a number of Youtube videos which appear to be recordings between several TDSB staff members. The way to defeat totalitarianism in the Toronto District School Board is not to censor Youtube videos , but to tell the truth. The recognition of the fact that a journalist called Roselands Junior Public School on September 15, 2014 and had his phone calls disconnected at Principal’s knowledge shows how unprofessional some of the Toronto District School Board employees conduct themselves as public sector workers. Criticizing some of the employees’ conduct at the Toronto District School Board is a moral commitment in ensuring that our children receive the best education in Canada from competent workers who follow the rules and standards of the teaching profession in accordance to provincial and federal regulations. Suppression of criticism through SLAPP lawsuits, libel chill and police corruption do little to foster democracy in Canada. The Principal of Roselands Junior Public School Jill Norman had knowledge that a journalist called her school on September 15, 2014 concerning incidents of unreported child abuse in Canadian schools, and that the secretary Anna Genua hung up the phone on him. In addition, the Principal immediately contacted the Communications Department and claimed that the secretary, Anna Genua, did not hear anyone when in fact the above Youtube link reveals that Anna Genua did speak to the journalist for a short moment. Why are some of the employees at the TDSB such liars? Based on an anonymous source, the TDSB contacted the Toronto Police Services in January 2015 when they found out the recordings were on Youtube. Why is the Toronto District School Board eager on removing those recordings from the internet? Is there really some form of cover up going on between staff at Roselands Junior Public School with regards to the unprofessional and discourteous phone service incident? Is there something more in which parents are not aware about? The journalist pointed out that he was investigating incidents of unreported child abuse in Canadian schools and he wanted to speak with the Principal. To his surprise, the phone calls were disconnected several times, including one by Anna Genua. A forensic analysis of the sound waves and sound output of one of the recordings reveal that in one instance the phone operator was told to “hang up” the phone by someone in the background. This explains that even though the Principals blamed her students for hanging up the phones, a teacher was in charge of supervising those students. Criticizing employees of the Toronto District School Board is not defamation of character. Discussing matters of public interest such as why did the staff at Roselands hung up the phone on an investigative journalist should not be defamation of character. On the contrary, it is the highest expression of concern for the children of the future. The Toronto District School Board should not be trusted to be honest in some cases, as in the abovementioned narrative about the staff at Roselands Junior Public School who disconnect phone calls from investigative journalists, while hiding under the protection of the Toronto District School Board to censor those recordings from the internet by using the police to engage in unconstitutional behaviour. Fortunately, the Toronto Police did not act on the unconstitutional requests by the Toronto District School Board because the Youtube uploads are protected under Free speech. It is irresponsible for any society to allow such conduct by the Toronto District School Board. TDSB Director Donna Quan should be ashamed for trying to foster and condone censorship of free speech. Too much “plain-as-day” commonsense; More than these “progressives” and their agents and enablers can swallow. America’s own “Cultural Revolution”. perhaps it’s time to scrape that piece off of our footwear…. Yes, indeed, about that death spiral. Take a tally of American attitudes in just the last eight or so years and you see how fast the death spiral is finally taking hold amongst Americans, and how precipitously fast American decline is unfolding in a historical timeframe. …or his standing as a libertarian. But like it or not, he has a large viewing base, and so what he says must be dutifully refuted by real libertarians. Maher’s opinion on economics seriously.